The slide switch at top left is to adjust the display brightness to one of three levels - an unusual feature. 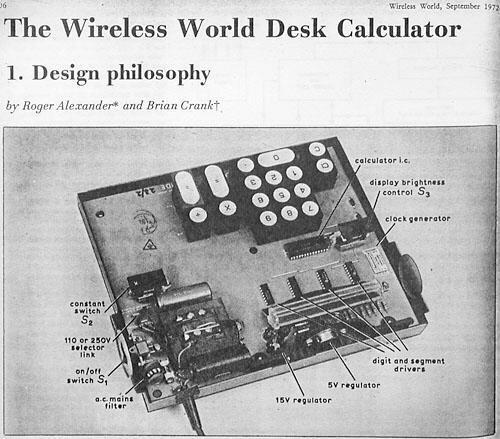 Advance/Wireless World desk calculator kit. 252 mm x 200 mm x 72 mm (10" x 8" x 3"). 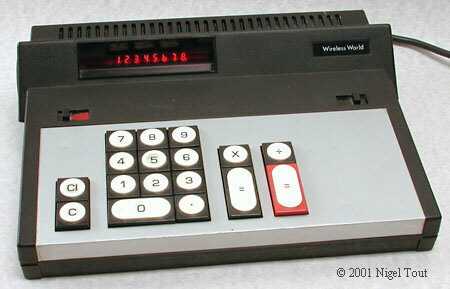 Integrated circuit is Texas Instruments first "calculator-on-a-chip", the TMS1802, here date coded 1971 week 38. All calculator functions are provided in the single Large-Scale Integration (LSI) integrated circuit. For further information see "The Calculator-on-a-Chip" article. Assembled from a kit produced by Advance Electronics in conjunction with the electronics and radio magazine "Wireless World". Details appeared in the September & October 1972 issues. The cost was £39.25 Sterling [about US$100]. Advance Electronics of Bishops Stortford, England. Further Advance calculators appear on the British Vintage Calculators site. Side view showing the unusual shape. The circuit board showing, from top to bottom, the LED display, four LED driver chips, the calculator integrated circuit (Texas Instruments TMS1802 "calculator-on-a-chip"), and the keyboard. On the far left, near the top, is the white, hybrid thick-film integrated circuit with the clock generator circuit, while at top-right is the power supply. 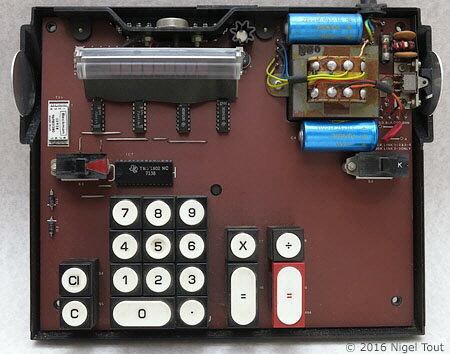 Integration of the electronics meant that by 1972 there was little electronics inside a basic desktop calculator. 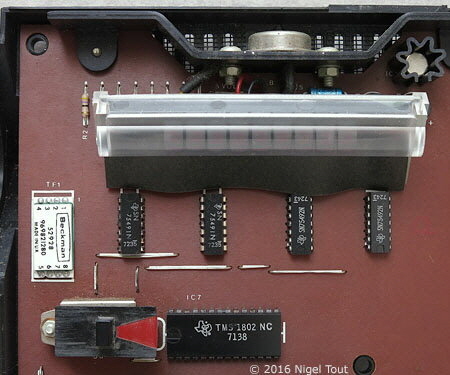 Close up of the circuit board with the Texas Instruments TMS1802 "calculator-on-a-chip", here date coded 1971, week 38. Interfacing the TMS1802 to the LED display are two SN75491 segment drivers (here date coded 1972, week 35) and two SN75492 digit drivers (here date coded 1972, week 43). At far left is the white, hybrid thick-film integrated circuit with the clock generator circuit, which helps to reduce the number of components. 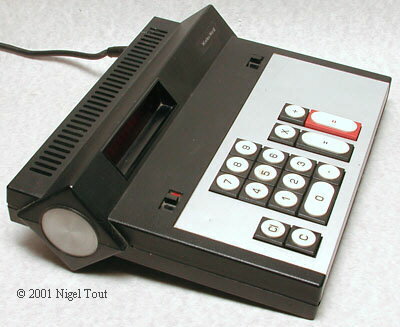 Several electronics magazines featured calculator designs in the early 1970s, and several companies supplied calculator kits, including Heathkit (see the Heathkit IC-2009) and Sinclair. These gave some cost saving and also the satisfaction of having assembled the calculator oneself. The kit companies usually had a scheme whereby you could return the calculator for fixing if it did not work properly ! In Britain there was an extra price advantage for the kits since they did not attract the Purchase Tax which was applied to complete calculators. This advantage was lost from April 1973 when the all-pervasive Value Added Tax (VAT) was introduced, which applied to almost all products.